Wellbeing leaders from Edmund Rice Education Australia schools have gathered at St Patrick’s College in Ballarat to focus on innovative initiatives in student and staff wellbeing. EREA runs more than 50 schools across every Australian state and territory, while connecting with an international community of 280 schools in 25 different countries. 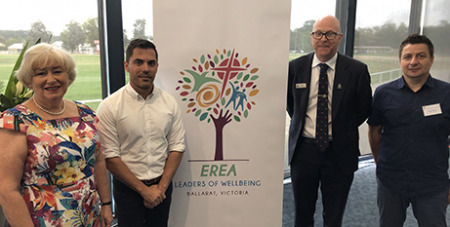 The three-day EREA Leaders of Wellbeing Conference is part of a collection of professional development and formation programs offered by EREA. Wayne Tinsey, the Executive Director of Edmund Rice Education Australia, opened the conference on Wednesday by raising the importance of both student and staff wellbeing as we live out our mission in the 21st Century. “The personal wellbeing of all in the EREA community is central if we are to offer a liberating education, based on a gospel spirituality, within an inclusive community, committed to justice and solidarity. As we offer service and support to all the students in our care, it is important that we are sustained spiritually, mentally and physically,” Dr Tinsey said. The conference, which concludes today, features a variety of speakers, workshop and experiences that focus on issues such as resilience, self-care, addictions, transitions and engagement. The delegates have particularly enjoyed seeing and learning about the innovative wellbeing and pastoral care initiatives happening at St Patrick’s College. “I also encourage you to reflect upon our rich Christian faith tradition as a centrepoint for your own wellbeing. Jesus lived his humanity so deeply and reflected the love of God so totally, that he reveals the very essence of God,” Dr Tinsey said.